Hey guys, just wanted to take the time to go over my Alolan Exeggutor deck that I played at Memphis to a 93rd place finish. The finish puts me up to 117 Championship Points on the season. Alolan Exeggutor was a deck I had been messing around with on and off. It was one of the non-GX Pokemon that looked like it could have interesting potential with Shrine of Punishment, so I made sure to test it out. 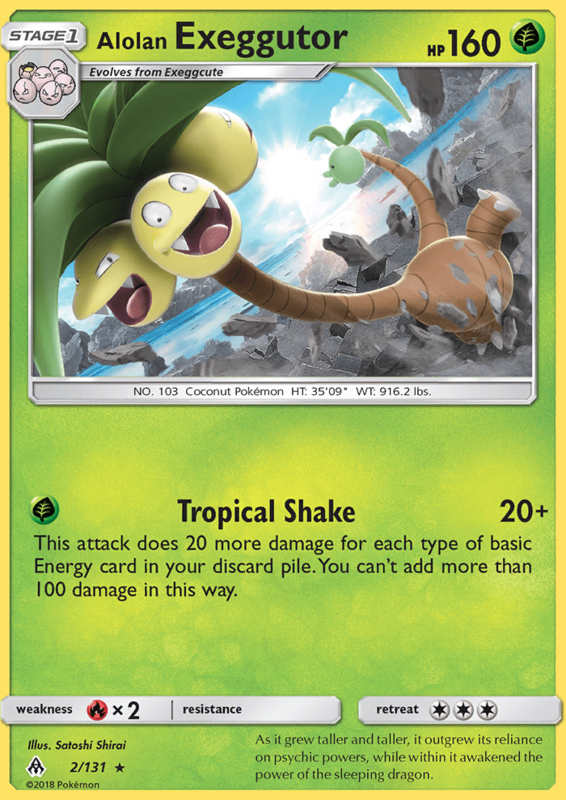 For those unfamiliar, Alolan Exeggutor’s Tropical Shake attack costs [G] and does 20 damage + 20 more damage for each different type of Basic Energy card in your discard pile, with you only being able to add 100 damage with this effect. That means you do 120 damage with Tropical Shake once you have your five different Energy in the discard. With a Choice Band you get up to 150 damage, with a damage tick from Shrine of Punishment that goes up to 160 and Professor Kukui could bring you all the way up to 180 damage in a single turn. Of course, when Shrine of Punishment is able to stick in play, you’re able to get even more damage counters into play so opposing Pokemon can be already pre-softened up by the time you attack into them. My first take on the deck included a 2-2 Ribombee line, using its Honey Gather Ability to get two Basic Energy cards from the deck with the goal of using then using an Ultra Ball to discard those Energy cards. Once you had your necessary Energy in the discard pile, you could still use Honey Gather to find your Grass Energy to attack for turn. In theory, it sounded great, but it didn’t quite work out in practice. The issue with this card was that you needed to get Cutiefly into play (this is a Nest Ball that isn’t being used on Exeggcute) and then get Ribombee into play (this is an Ultra Ball not used to find Alolan Exeggutor). Additionally, since you typically needed to use an Ultra Ball to search out Ribombee, that meant you were typically at best down to already 3 Ultra Ball already, making it difficult you to find the follow up Ultra Ball to discard the Energy you get off of the Honey Gather. After Ribombee didn’t pan out, what I ended up trying next was to just try to see as many cards as possible with Marshadow’s Let Loose, Sableye’s Excavate, and Acro Bike. It was at this point I ended up adding Mysterious Treasure into the deck to give me an additional discarding effect, which also was able to search out Marshadow, so it essentially fulfilled two roles of being able to discard Energy while also increasing my outs to Marshadow. Sableye is a hard card to quantify its value, but I’m pretty sure it’s actually good. It’s Excavate Ability does a few things for you. It can get an Energy in your discard pile to boost the damage output of Tropical Shake. It can inform you of your top deck, which can change the moves you make during your turn. It also can thin your deck of resources you won’t need in a given deck, making it more likely for you to draw the cards you actually want to see later in the game. Oranguru SUM was another consideration, but ultimately I wasn’t comfortable adding a two retreat Pokemon into a deck while shorting a Guzma and without room for any other switching effects. One note on Sableye is to make sure to use Excavate every turn. As I said, it’s hard to quantify its value, but each time you use Excavate you are typically going to be improving your win probability in some way. It’s very easy to forget to use it when you’re comfortably winning a game, but making sure to use it is important as it will help ensure you don’t let that comfortable lead slip away. The final piece of the puzzle was Oricorio, which was able to search the deck for two Basic Energy cards when you played it onto your bench from your hand with its Vital Dance Ability. It was only a one time effect, but it also only took up a single deck slot, which made it easier to fit into a consistent deck than Ribombee, with the added benefit of being another Pokemon that could be searched out with Mysterious Treasure. Once I got the list to a competent level, it ended up testing pretty well against the most played meta decks so I felt pretty comfortable taking it into Memphis. There isn’t a whole lot to say about the list. I think this is a pretty straight forward list. I’m not in love with shorting a Guzma, but in a matchup like VikaRay where they’re going to be OHKO’ing your Alolan Exeggutor turn after turn, you will probably be forced to play draw Supporters most turns to keep a stream of Alolan Exeggutor going, so I felt it was best to prioritize my draw than maximizing my Guzma count. It is worth noting that you can combo Guzma with Let Loose to get the gust effect and draw in the same turn. I tested quite a bit with 4 Choice Band, and with that many, I was seeing it in too many hands, so that ended up getting changed in here. While some Buzzwole/Garbodor decks cut down to 2-3 Shrine of Punishment, I wouldn’t recommend that here. This deck is much more dependent on getting the Shrine Damage than that deck is. I feel that it’s worth going over the different angles you can take towards getting your Energy in the discard pile. There are some very obvious ways to do it, but there are some more subtle ways to do it that aren’t immediately apparent. Discard with Ultra Ball or Mysterious Treasure (sometimes using Oricorio to search them out). Discard with Sableye’s Excavate Ability. Turn 2 retreat/knockout – The deck won’t be attacking for damage on the first turn of the game, so your turn 1 attachment is always going to be an extraneous attachment. So this Energy card, you can attach to your Active Pokmeon and then this Pokemon either gets knocked out by your opponent, or you retreat it, discarding that Energy. If you you open a Grass Energy and start a non-Exeggcute Pokemon, it can make sense to attach to the Exeggcute on the bench, and then go for your discard Energy for your active with your turn 2 attachment. In general though, if you draw into the off type Energy, then you just attach it to your active Pokemon to ready it for retreat on turn 2. Mid Game Extraneous Attachments – With 160 HP, Alolan Exeggutor typically doesn’t go down in one hit in most matchups. This means you will get extra Energy attachments throughout the game. If this is a Grass Energy , it typically makes sense to attach to one of your benched Exeggutor lines, but if it’s an off Energy, you can attach it to Marshadow or Oricorio, and then whenever your active Alolan Exeggutor is knocked out, you can promote that Pokemon active and retreat it at the start of your next turn. You can also attach to these Pokemon and then use a Guzma to discard it as well. Alolan Exeggutor knockout – It’s not uncommon to only be hitting for 80-100 damage with your first Tropical Shake of the game. You then get more turns to find more Energy to start getting in the discard. It’s not uncommon for your first Grass Energy of the game to go into the discard pile when your first Alolan Exeggutor gets knocked out. The one note on Energy is that with Energy Recycle System, be careful that you’re not removing a necessary Energy for your damage output. Most of the time you will use it to put Energy back in hand, but in some games, when you have your Alolan Exeggutor setup for the remainder of the game, it can make sense to load Grass Energy back into the deck to maximize your probability of drawing into them. Additionally, if you already have five Energy on the discard pile, it’s best to leave extra Energy on Sableye, Oricorio, or Marshadow than to retreat to discard it, as discarding it serves no purpose, while keeping it in play gives you something you can Guzma into and retreat out of. That’s about it for the deck. The deck is very linear and doesn’t really have tricks. I built it to do its one thing as good as I could make it. Any skill play from the deck will be derived from using proper sequencing and making intelligent decisions on Acro Bike and Excavate. Here is a quick rundown of my thoughts on the matchups headed into the tournament and coming out of it. This matchup is pretty favorable for you. With two Marshadow, you can be pretty disruptive to their setup. In this matchup, I generally try to disrupt them being able to get Vikavolt out with Let Loose, typically using one on turn 1 if they have used a Lillie to get a big hand, and then saving the second for after they use Tempest GX. (This of course is reliant on not prizing one, or not starting one of them). Once the game starts, you just swing into their Pokemon. It’s a mixed bag on whether they play counter Stadiums or not. If they are, they’re typically playing Lysandre Labs, which is actually pretty good as it shuts off the effect of your Choice Band, which can make you whiff your damage numbers. However, you play 4 Shrine and they are typically playing a low Stadium count, so for the most part Shrine will stick in play. The big thing in this matchup is being able to draw into Choice Band once you have your five Energy into the discard pile. With Choice Band you are doing 150 damage, which means 3 in between turns of Shrine of Punishment damage will knockout a Rayquaza GX, so not having to discard Choice Band with Ultra Ball or Acro Bike can be pretty important in this matchup. Dhelmise / Shining Lugia are mostly non-factors in this matchup. Neither can OHKO an Alolan Exeggutor, so you can trade evenly with them, and you can even OHKO them with Professor Kukui. Vikavolt, similarly doesn’t OHKO Alolan Exeggutor, and also has a costly discard, but it is a little bit better in that it can’t be knocked out with the aide of Professor Kukui. When they attack with Rayquaza GX, you can start trading 2 for 1 with them. I had this pegged as the matchup I wanted to see most at Memphis and unfortunately I didn’t get to play against it. If you’re worried about Malamar (which is probably a good thing to be worried about after it finished 2nd and 1st at the opening Regional Championships of the season), then Alolan Exeggutor is a good option as it dominates the matchup. The logic of the cards works greatly in favor of Alolan Exeggutor. To put the matchup simply, their non-GX’s (Deoxys, Mimikyu) don’t OHKO you while you OHKO them, allowing you to get a 2 for 1 prize trade against their non-GX attackers. If they go the GX route, you similarly will trade 2 for 1 with them, with the aide of Shrine of Punishment damage. The most popular Malamar list is built around attacking with Marshadow GX when going the GX route, and that only has 150 HP, so you don’t even need Shrine of Punishment, just a Choice Band, to knock it out. Gustavo Wada’s list did play a Lunala Prism Star, which does have the potential to OHKO an Alolan Exeggutor, but they would need to get 8 Energy into play to do so, so while it technically can, it’s unlikely that it actually would. It has 160 HP, so it can’t be OHKO’d by Alolan Exeggutor, but since it’s typically not going to be taking a OHKO, you can safely trade 1 for 1 with it. Once it gets knocked out, it will go to the Lost Zone, so you won’t see it again. From all the games I’ve played in this matchup, it seems pretty even as long as they’re playing the standard 2 Acerola/1 Pal Pad variant of the deck. If they play a 2nd Pal Pad, you pretty much have no hope at winning as they will eventually out heal you if they play it right. With only having four Acerola available, the game will go right down to the wire, and will often come down to whether you can find a Guzma at the end of the game to drag up a damaged Tapu Lele GX or whether you can stream one last Alolan Exeggutor. If they prize the Pal Pad or one of the Acerola and can’t draw it out of the prizes, they will typically lose. I do think this matchup probably can be teched against. A single Acerola / Max Potion to heal your Alolan Exeggutor could be enough to win the matchup, although you would need to find a cut to fit this in. Another way you could go about it is playing Buzzwole FLI and a Fighting Energy. With Oricorio you could search out the Fighting Energy for Buzzwole, and then take a OHKO with Sledgehammer on the four prize turn. Being able to get a OHKO at some point in the game should win the matchup in itself. When playing a non-teched version, my best advice would be do your best to limit the amount of non-Exeggutor lines you play onto your bench to limit the Guzma targets the Zoroark deck has for OHKO’s. I was a little worried about this matchup early on, but it ended up testing really well as they can struggle to knock you out, while you’re typically fine for OHKO’ing them in some way. Baby Buzzwole can be awkward to knockout, but that’s okay. There are a few ways to deal with it. Early game you may need to 2HKO it, which can be fine, as they may need to 3HKO you anyhow. Once you have your five Energy in your discard pile, you can OHKO them with Professor Kukui. Alternatively, you can work around them and play Guzma to knockout a lower HP Pokemon on their bench. The two Pokemon I typically target down are the Magcargo or Diancie Prism Star. Magcargo to shutoff their search engine, and Diancie Prism Star to limit their damage output. If Diancie Prism Star is knocked out, Baby Buzzwole takes at best a 3HKO with Beast Energy attached with Sledgehammer, or a 6HKO without Beast Energy when not on the four prize turn. Garbodor can take OHKO’s on you, but this aspect of the matchup is very random. Some games you just won’t need many Item cards to get setup, and Garbodor will be forced to 2HKO you while you OHKO them. Some games, you will be forced to play a bunch, and Garbodor OHKO’s you. Even when Garbodor is taking OHKO’s, it’s not that bad of a situation as it only has 120 HP so you can pretty easily OHKO it back. They can typically stream 2-3 Trashalanche back to back, but after that it gets hard for them to further stream them, while it’s easier for Alolan Exeggutor to stream throughout the game with a 4-4 line (compared to a typical 3-2 Garbodor line). Of course, still try to limit your Item counts to prevent Trashalanche from even being able to OHKO you if you can. Similarly, try to limit yourself to only 2 Ability if possible to prevent Weavile from being able to OHKO your Alolan Exeggutor. (They can do so with 3 Ability and Professor Kukui, or just 4 Abilities in play). When going blind into the matchup, I would play it as if the opponent had Weavile. Buzzwole GX/Lycanroc GX – ??? I don’t think I got any games in against this headed into the tournament, as I was pretty busy the week right ahead of Memphis and it was one of the later decks to emerge into the meta. I would think something like Kyle’s third place list with no healing would be pretty favorable, as their non-GX won’t OHKO, and then you can out trade the GX Pokemon, while also hitting Lycanroc GX for weakness. I could see the 2x Acerola in Begerac’s list making the matchup very close, but the damage output might still not be there. I would definitely look at targeting down the Diancie Prism Star to limit the damage output they can get from Jet Punch and Sledgehammer. The more attacks they need to take a knockout the better for you. Headed into the tournament, this matchup seemed very unfavorable for me. You typically fill up your bench getting setup, and not being able to freely play down Exeggcute as you draw into them can make things awkward for getting your setup. Then at some point in the game, Tapu Lele can come in and take a bunch of prizes at once with Magical Swap. Something else awkward is that any time you whiff an Alolan Exeggutor after your Exeggcute has been to spread to once means that Exeggcute is getting knocked out with the next spread as it only has 40 HP. In both of my games in Memphis against this deck I ended up whiffing the Alolan Exeggutor and having this scenario play causing some quick concessions both games. I haven’t actually played against the Passimian variant of spread yet, but I would imagine it’s an even worse matchup than the normal version, as they can use both the spread strategy, and fairly easily take knockouts against Alolan Exeggutor with Passimian. It is possible I just wasn’t playing this matchup well in the games I played it, but I do think it’s really hard to get your setup without playing your Abilities…like those Marshadow and Oricorio are in the list for a reason. Sure, some games you could get setup without them, but those games are going to be few and far between. I don’t want to go into too much depth into the other matchups, but here are some quick thoughts on the rest. Straight Golisopod GX – Untested, but seems favorable. Would use a similar strategy to what Zoroark GX does in the matchup, but with worse consistency. Lapras GX/Quagsire – Favorable – Mostly GX oriented, and most of the deck is weak to Grass. Glaceon GX/Zoroark GX – Favorable – GX heavy deck that is mostly reliant on 2HKOs. Malamar/Shrine – Favorable/Unfavorable – This matchup pretty much comes down to whether or not they play a Tapu Lele or not to rearrange damage at some point in the game. If they do, they typically win, if not, I think you will win this matchup. Same principles as BuzzGarb apply, use Professor Kukui to knockout their active attacker if it has 130, otherwise try to use Guzma (on a Malamar in this matchup). Sylveon GX – Unfavorable – This tested unfavorable in the handful of games I tested against it. Starting anything except Alolan Exeggutor meant a loss, and if you had to play Marshadow because you didn’t open a Supporter or ended up in a dead hand after a Supporter, that can be dragged up with Counter Catcher and used by them to get to victory. Magnezone/Dusk Mane – Untested/Unsure – Not sure what to make of this matchup. It can be pretty well disrupted with Marsahdow, so it is possible they just don’t get setup. However, once setup, I can see how a list with Solgaleo Prism Star and Heatran could create winning games states against you thanks to their high HP, and in the case of Solgaleo Prism Star OHKO potential. Metagross GX – Unfavorable – They typically play 4 Max Potion, allowing them to tank through your hits for awhile. Additionally, with Dhelmise they are able to hit for 160 and OHKO your Alolan Exeggutor. Reshiram GX/Ho-Oh GX/Victini – Even – I think this matchup is mostly even. You are able to take advantage of the non-GX for GX prize exchange, but they’re also fire type, so they’re taking OHKO’s, and they do have Victini, which allows them to trade a non-GX with you. Thanks to Reshiram GX’s GX attack accelerating Energy while taking a OHKO, they do a decent job at keeping attackers streamed through the entirety of the deck. As they’re able to OHKO you, and have that Victini now for a non-GX prize exchange turn, you really need to hit all your beats against this deck, otherwise you can quickly find yourself in a losing position. Overall, I think the deck has a pretty good matchup spread. Against the power 3 decks of the format (Malamar, VikaRay, and ZoroRoc), it’s favorable against 2/3, and seems pretty even against the third. The BuzzRoc matchup definitely needs more testing now that it’s establishing itself as a meta force again. It’s a mixed bag against lower tier stuff however, taking losses to stuff like Metagross GX and Spread, but dominating decks like Lapras GX/Quagsire. The decks worst enemy is itself. Sometimes you just don’t get setup and lose as a result of that. Engine wise, this list is less consistent than both Zoroark GX and Malamar. The one thing that should be noted about this deck is that it is slow. You’re reliant on doing 120 damage for the entire game, so you don’t have a quick way to close out games with powerful OHKO’s against the bulkier decks. Games can quickly become grinds, especially against decks that can heal, which makes this deck pretty susceptible to natural draws in a best of 3 setting, so this deck might actually be better suited for a best of 1 League Cup setting. I do think this deck is going to be a good play for the next few weeks of tournaments until Lost Thunder comes out (I have no opinion on its viability once that set comes out, but it does receive cards that improve it). It just has too good of matchups against Malamar and VikaRay to be written off. As far as my Memphis tournament goes, I had some bad variance in some instances, and I think some high finishes would have resulted from this deck if more players had played it. I only went first in 1/9 games during the tournament, and played against 4 rogue decks, going 1-1-2 in those matches, but 4-0-1 against the meta decks I played. I certainly did catch a few lucky breaks throughout the day myself, but with the lack of going first, and getting paired against Spread and Metagross GX, I can definitely say I wasn’t close to getting the ideal day for this deck. This deck is definitely worth a try based on its good matchups against some of the top decks. I know it did win a League Cup on Sunday last weekend after I posted my list Saturday night, so there is some further proof towards its competitive viability. This should be a great player for this weekend, especially with Malamar looking like it’s about to see an explosion in play. Great article and great deck! Thanks for posting!